Here’s where it gets more complicated. Investigators interviewed 114 of those patients and about 60% of them reported frog exposure. Out of the patients who knew the type of frog, about 80% reported coming in contact with ADFs. In other words, salmonella infection was significantly associated with frog exposure in the study. The investigators concluded the majority of children got sick from indirect exposure to these animals, such as handling aquarium water. Mettee Zarecki stressed that parents and/or children should wash animal habitats outside to avoid contaminating their kitchen sink or bathtub. Investigators said aquarium water can become more contaminated over time, increasing infection risk. Mettee Zarecki said 29% of patients - mostly children - were hospitalized in this investigation. Investigators tested samples from the frogs’ aquariums in patients’ homes, pet stores and a day care center that all matched the outbreak strain. According to the CDC’s website, patient purchases led investigators to one ADF breeding facility at Blue Lobster Farms in Madera County, California. What’s troubling is frogs carrying the outbreak strain from this facility could still be in households, continuing to spread the infection. Surprisingly, pet frogs can live to up 18 years, more akin to a pet dog than a goldfish. The investigators want pediatricians to warn patients of the risk associated with pet frogs. If you do come in contact with an amphibian or reptile, investigators recommend precautions like washing your hands with soap and warm water and using hand sanitizer. My husband just said the same thing & lizards,too Blah,I hate 'em all Blah,,Yuck,slimey,ugly,creepy,etc. Don't put your frogs (or other amphibians and reptiles) in your mouth. Wash your hands after handling. Basic. I heard years ago that turtles carry Salmonella. Wonder why the delay in checking frogs too. Not only is it old news but they identified the frog incorrectly. That's an African Clawed Frog from the genus Xenopus. It may be a dwarf variant but it is incorrectly identified. Facts are ever so important. Sorry, but you are incorrect. Yes dwarf and claw frogs look almost exactly the same when young and small. However the difference is the webbing in between the toes. 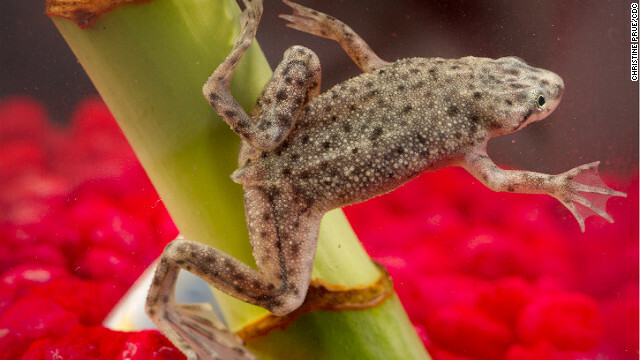 African DWARF frogs have the webbing as seen in the photo. And African Claw frogs DON'T have the webbing. This is a fantastic article! Very well written and informative, appreciate the insight, Miss Welsh! The expert in this study was quoted on another website, Mother Nature News, saying this: Shauna Mettee Zarecki, the study's lead author from the CDC in Atlanta. "The majority of people didn't realize there were any risks from these amphibians or other amphibians, like turtles and snakes," she added. Again, factual information? Let's make a similar statement to see the problem. "Pitbulls kill a lot of people like other dogs, lions and tigers"
are other frogs like the clawed frog safer? Just don't eat the frogs. This isn't France or China. I definitely wanted to compose a simple remark in order to appreciate you for the splendid points you are sharing on this site. My rather long internet look up has now been honored with beneficial facts and techniques to talk about with my co-workers. I 'd tell you that most of us website visitors are unquestionably blessed to live in a useful community with many special people with interesting hints. I feel rather happy to have come across your site and look forward to tons of more entertaining times reading here. Thanks a lot once again for everything. Dude.. I'm not substantially into studying, but somehow I obtained to undergo lots of guide articles with the online web page. Its awesome how attention-grabbing it actually is for me to go to you pretty frequently. Youre so cool! I dont suppose Ive read anything like this before. So nice to search out somebody with some authentic thoughts on this subject. realy thank you for starting this up. this website is something that is needed on the net, someone with a little bit originality. useful job for bringing something new to the internet! You've got a stunning portrait of Rebecca Van Dyck. From a Levi's Director of Marketing to Head of Marketing, Facebook, this lady will need to be a marketing genius. Youre so cool! I dont suppose Ive learn something like this before. So good to search out someone with some authentic ideas on this subject. realy thanks for beginning this up. this web site is one thing that's wanted on the net, somebody with a little bit originality. helpful job for bringing one thing new to the web! You’ve made some really good points there. I checked on the internet to find out more about the issue and found most individuals will go along with your views on this site. I really want to thank Dr Aluta for saving my marriage. My husband really treat me bad and left the home for almost 1 month i was sick because of this,i was not my self again, then i told my friend about my husband case then she told me to contact Dr Aluta that he will help me bring back my husbandt he told me that my husband is under a great spell of another woman. They cast a spell of return back of love on him. And he came back home for forgiveness and today we are happy again, i want you all who are having relationship, ex and even husband problem to contact Wish you all success. You have a great skill in writing, really well done. A large percentage of of what you assert is supprisingly appropriate and it makes me wonder the reason why I had not looked at this in this light previously. Your piece truly did switch the light on for me as far as this particular issue goes. Nevertheless at this time there is one particular point I am not really too comfy with and whilst I try to reconcile that with the main theme of your point, allow me see exactly what the rest of the visitors have to point out.Very well done. Yo no estoy en linea con lo aqui escrito, pienso sinceramente que hay muchos elementos que no han podido ser considerados en cuenta. Pero valoro mucho vuestra exposicion, es un buena web.